Photograph depicts an aerial view of Bar-Ilan University and the surrounding area. 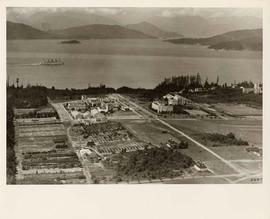 Photograph depicts the Agriculture Department's fields at the University of British Columbia in Vancouver, British Columbia.Close up of sectioned, low, shrub-like plants with the appearance of clover. 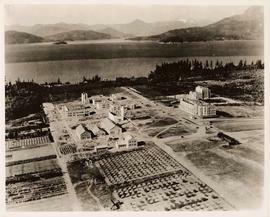 Photograph depicts the Agriculture Department's fields at the University of British Columbia in Vancouver, British Columbia.Front shot of sectioned, low, shrub-like plants; Brock Memorial building in background. Photograph depicts plants being measured.Close up portrait shot of short, shrub-like foliage; ruler positioned horizontally above plants; measures up to four and three quarter units. Photograph depicts alfalfa plants for the Agronomy Department at the University of British Columbia.Close up, possibly macro, shot of shrub-like plant with many stems.